In A Real Prince Is Hard to Find follow Will and Kate through their childhood days, their grand wedding, their international travels… and (of course) the arrival of their royal baby. 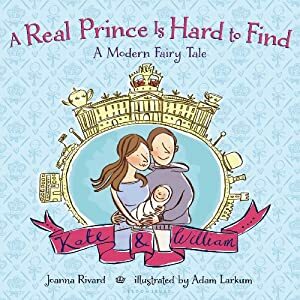 Based on a popular app from Ink Robin, with illustrations by Adam Larkum that bring both the English country-side and the streets of London to life, this delightful picture book will make readers young and old alike fall in love with everyone’s favorite royal couple all over again. This was a cute story that pulled together the life story of both William and Kate. While it is short, it covers many of the high points of their relationship as well as their upbringing, to now being parents. The story was written with young readers in mind and is beautifully illustrated, which draws the reader in even further. This was a nice story for anyone who has been following or is interested in the royal family in England.